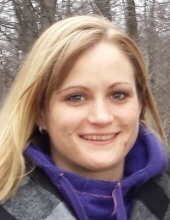 Sarah Louise Bedick, 33, of Utica, Pennsylvania passed away on March 29, 2019 at Hamot Hospital in Erie. She was born in Oil City, PA on February 17, 1986 to John W. Bedick and Michelle Maloney Bedick. Sarah’s only sibling, Ian Bedick of Franklin, PA is married to Ashley Trauterman Bedick, and they along with their two children, Colton and Aria Marie, gave Sarah much joy. Sarah graduated from Franklin High School in 2005 with a degree in cosmetology and throughout her adult life was known for generously giving haircuts or beauty services to friends and family. She earned an associate’s degree from the Pennsylvania Technical Institute (PTI) in Pittsburgh, PA in 2007. She worked as a sales representative following college graduation and was most recently was employed as a server at Primo’s in Franklin. Sarah had a life-long love of horses and was always ready to ride. She shared this love with children volunteering to give them rides whenever possible. She also enjoyed golfing with her father, playing pool, and spending time with her friends of which she had many. Friends Nate and Jen Boland of Turtle Creek, PA and cousins, Rebekah Eakin of Utica, and Grant and Jen Burgert of Madison, IN, attended Sarah during her passing. Sarah’s mother, Michelle Maloney Bedick Omiatek, preceded her in death in 2004. Her father, John W. Bedick, whom she loved and spent much time with resides in Utica, Pa. He will hold a memorial service for her on April 20, at the Presbyterian Church in Utica, at 11 AM and invites family and friends to attend. The Venango Area Riding for the Handicapped Association (VARHA), www.varhacenter.org, has been designated as the organization to receive donations in Sarah’s memory. The family would also like to express appreciation to CORE, the Center for Organ Recovery Education, for their generous support during Sarah’s brief illness. It gives the family some consolation that Sarah’s gift will give life to others. To send flowers or a remembrance gift to the family of Sarah Louise Bedick, please visit our Tribute Store. Guaranteed delivery before Sarah 's memorial service begins. "Email Address" would like to share the life celebration of Sarah Louise Bedick. Click on the "link" to go to share a favorite memory or leave a condolence message for the family.